Primary tumors of the heart are quite rare found in 0.04% of autopsies. In decreasing order of frequency, the benign tumors encountered in the heart are myxoma, lipoma, fibroelastoma, rhabdomyoma, hemangioma, and lymphangioma. Malignant tumors are still rare such as rhabdomyosarcoma, angiosarcoma, and malignant mesothelioma. Myxoma is the most common primary tumor of the heart comprising about 50% of all primary cardiac tumors. Majority of them occur in the age group of 30–60 years. Myxomas may be located in any cardiac chamber or the valves, but 90% of them are situated in the left atrium. We here present a case of myxoma in the 65-year-old female which is located in the right atrium. Atrial myxomas are the most common benign primary cardiac tumors. They arise most commonly from the left atrium. Myxomas are more common in women around 40–60 years of age., There presentation varies from completely asymptomatic to dangerous myocardial infarction due to emboli from tumor mass. 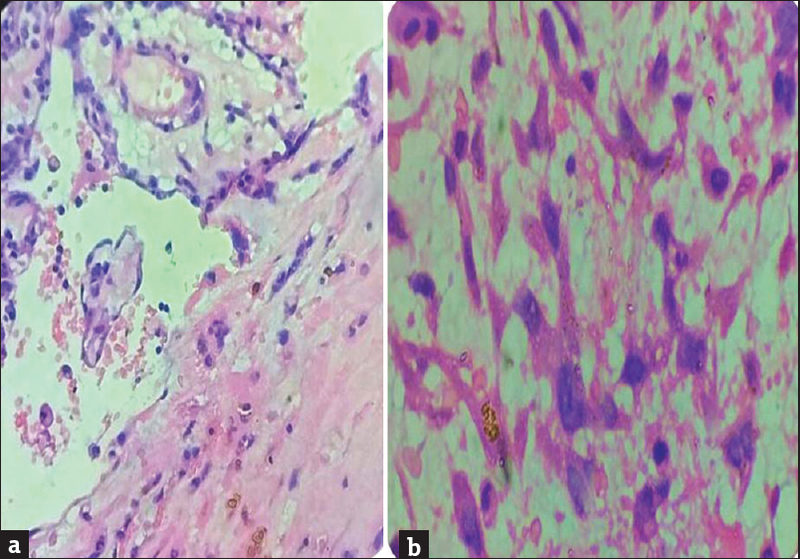 It has long been questioned whether cardiac myxomas are truly neoplastic lesions, hamartomas, or organized thrombi, but the weight of evidence is on the side of benign neoplasia. All the tumor cell types present are thought to derive from differentiation of primitive multipotential mesenchymal cells. A elderly female presented in outpatient department with pyrexia of unknown origin. She complained of occasional palpitations and class 2 dyspnea. She was a known case of hypothyroidism with thyroid-stimulating hormone levels of 7 μ/L and normal T3 and T4 levels with regular consumption of thyroxine tablet 100 microgram since the last 10 years. Her baseline investigations were normal. In view of occasional palpitations and New York Heart Association class 2 dyspnea, two-dimensional (2D) echo was advised by cardiologist which showed giant right atrial myxoma with dimensions of 6 cm × 4 cm × 4 cm in size attached to interatrial septum [Figure 1]. There was right atrial and right ventricular hypertrophy with mild tricuspid regurgitation. Ejection fraction was good. 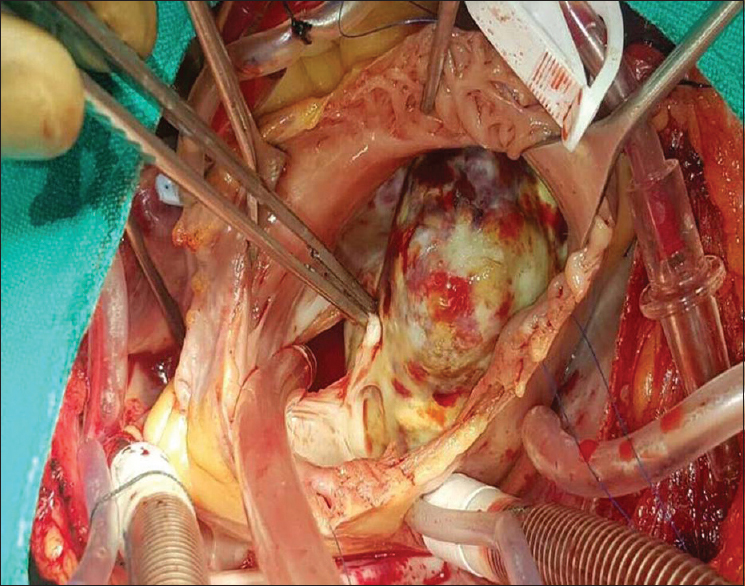 The patient was posted for removal of the right atrial myxoma under cardiopulmonary bypass [Figure 2]. Surgery was done and the specimen was sent for histopathological examination. Grossly, we received already cut opened single soft-tissue mass which measured 6 cm × 4.5 cm × 3 cm, externally capsulated, gray-white with focal gray-brown areas with smooth surface [Figure 3]a. Cut section of the mass is brown with areas of hemorrhages along with focal gray-white areas and hard areas are seen and it is firm in consistency [Figure 3]b. Multiple sections were taken from different areas and submitted for histopathological examination. 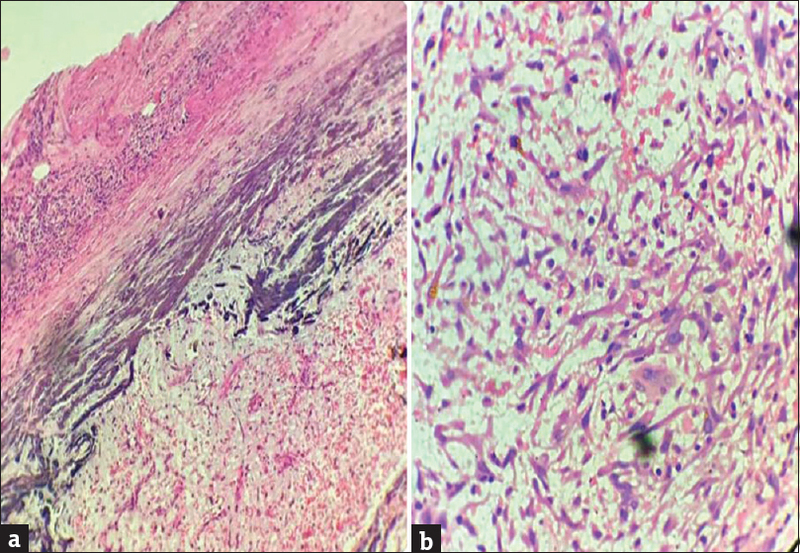 On microscopy-sections studied show tumor tissue surrounded by fibrous capsule, underlying stroma shows sparse tumor cells within the background consisting of myxoid and loose fibrous tissue [Figure 4]a. Tumor cells are arranged in singly scattered and aggregates in small nests and cords at places [Figure 4]b. At places, cells are seen forming rings surrounding vascular channels [Figure 5]a. Individual cells are elongated, spindle-shaped, bipolar, and stellate with moderate amount of eosinophilic cytoplasm. Nucleus is round to oval with inconspicuous nucleoli [Figure 5]b. In addition, several Gamna–Gandy bodies and areas of hemorrhages seen in [Figure 6]. 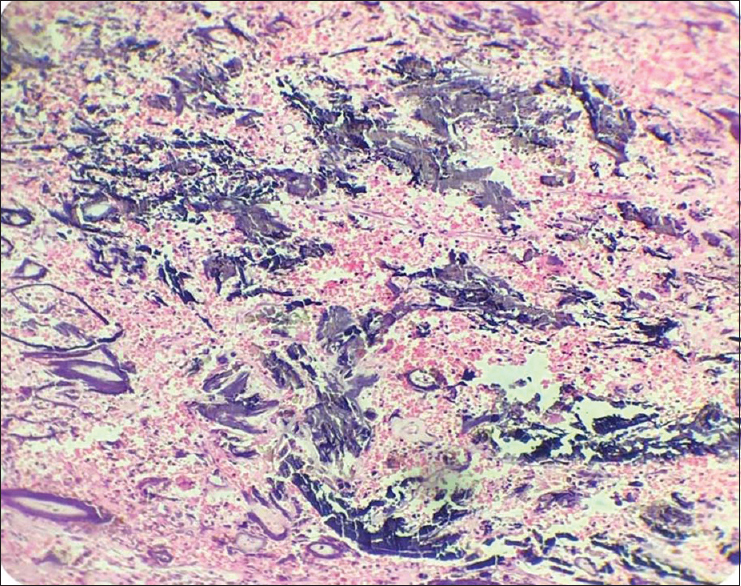 Based on the above histopathological features, it was diagnosed as myxoma. Myxoma occurs in two settings: sporadic and familial. The sporadic tumor occurs in the middle-aged women, usually in the left atrium, nearly always as a single tumor and without associated conditions. The familial variety is a disorder of young people, slightly more frequent in men, less commonly located in the left atrium. Left-sided cardiac myxomas may present with signs of mitral stenosis or insufficiency and right-sided tumors with dyspnea, syncope, distention of neck veins, and other symptoms. Approximately 10% of patients with myxoma have a familial cardiac myxoma syndrome (known as Carney syndrome) characterized by autosomal dominant transmission, multiple cardiac and often extra cardiac myxomas, spotty pigmentation, and endocrine overactivity. A careful history and physical examination in patients with cardiac myxoma is important to identify other signs of the Carney complex, as this diagnosis carries implications for family members of the patient. The gene PRKAR1 on chromosome 17 is mutated in about half of the known Carney complex kindreds, while most of the other kindreds have abnormalities in the locus 2p16. 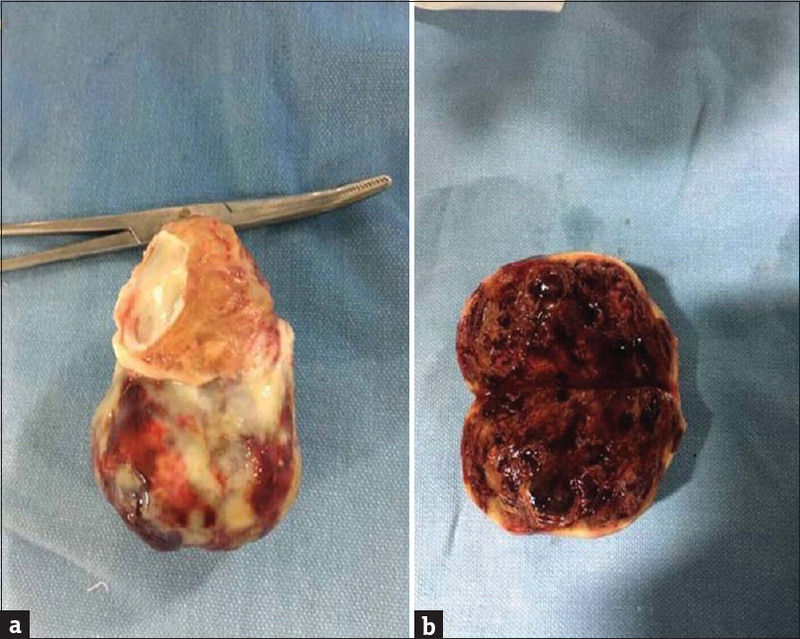 Atrial myxoma is a rare benign cardiac tumor presenting with various signs and symptoms; its spectrum varies from completely asymptomatic to life-threatening events due to embolic phenomenon and obstruction of mitral valve. Early diagnosis and timely surgical management give the patient a completely asymptomatic life as recurrences are extremely rare. Right atrial myxoma may or may not produce characteristic findings on auscultation. 2D echocardiography is the diagnostic procedure of choice. Most atrial myxomas are benign and can be removed by surgical resection. Cannavà G, Currò A. Left atrial myxoma presenting as acute coronary syndrome. Int J Cardiol 2015;190:148-50. Layton S, Ripley DP, Bellenger NG. Left atrial myxoma. BMJ 2013;347:f4430. 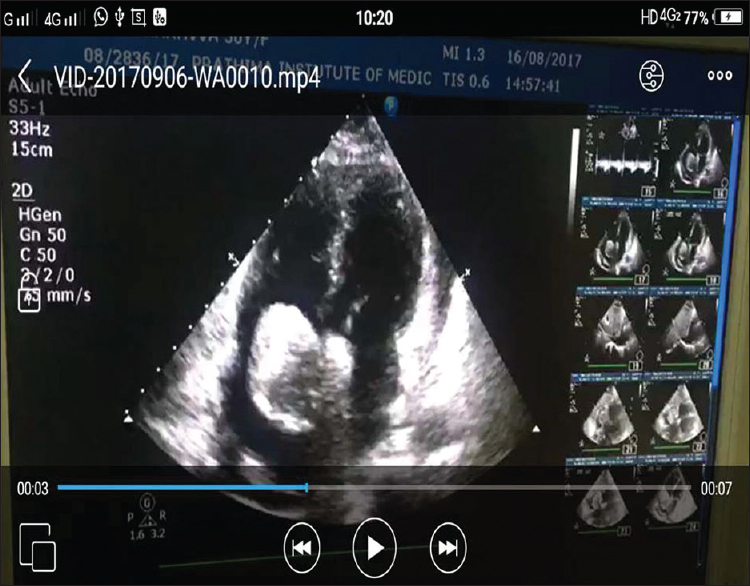 Chockalingam A, Jaganathan V, Gnanavelu G, Dorairajan S, Chockalingam V. Severe left ventricular dysfunction in left atrial myxoma – Report of 2 cases. Angiology 2006;57:119-22. Gošev I, Paić F, Durić Z, Gošev M, Ivčvić S, Jakuš FB, et al. Cardiac myxoma the great imitators: Comprehensive histopathological and molecular approach. Int J Cardiol 2013;164:7-20. Diaz A, Di Salvo C, Lawrence D, Hayward M. Left atrial and right ventricular myxoma: An uncommon presentation of a rare tumour. Interact Cardiovasc Thorac Surg 2011;12:622-3.